This morning I went a little crazy trying to figure out how to update the target destination URL for the *|FACEBOOK:PROFILEURL|* merge tag in my Mailchimp template. I’d share this tip since the solution was surprisingly unintuitive. If you build a campaign using a Mailchimp template as a starting point, you’ll probably notice a “friend on Facebook” link or icon automatically inserted into the header or footer. At least in my experience, this link often (a) does nothing, or (b) links to the wrong page, for example your individual Facebook profile instead of the Facebook business page you’re promoting. Open up the template you use to send your campaigns. 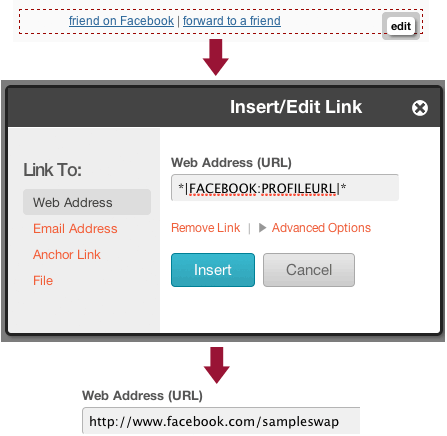 Replace the “*|FACEBOOK:PROFILEURL|*” tag with the actual URL of your Facebook page. Don't bother with the FB Merge tag. Just hardcode your Facebook URL. Tough luck. If you like, you can try this: Select Account: Integrations and then connect up the Mailchimp integration app to your Facebook account. The upside is that you will now be able to add a “Subscribe to my newsletter” type tab to any of your Facebook page(s), and I believe you can even get Mailchimp to auto-post your campaigns to your pages. (Confirmation anyone?) The downside is that the FB merge tag in your template will still link to your individual / personal Facebook profile page. You can’t make the merge tag point to a particular Facebook page for which you are an admin. You can get more details on this issue here. This was exactly what I was looking for. And yes!!! Why in the world can’t we change the merge tag later on in the process!??! Too bizzare. Problem I had was that even when I changed the actual URL to our FB URL, it didn’t seem to work in the campaign itself. Clicking on the link still did nothing. Perhaps I did something wrong. I will give it another shot. thanks for the post. Excellent post. I am dealing with some of these issues as well. Thank you for this post – I hope they figure out this issue soon. Thanks for your post!!! I just spent 2 hours trying to fix this, and it’s been driving me crazy. I did send a request to Mailchimp support, so I’m curious what they come back with (still waiting for their reply). “The *|FACEBOOK:PROFILEURL|* merge tag will only display the Facebook profile that’s connected to your Mailchimp account through our integrations page. If you would like to have a Facebook link point towards a different Facebook page or group you have a couple of options. Option #1: You can do away with the *|FACEBOOK:PROFILEURL|* completely and simply manually type in “Join our Facebook Group” in your campaign and then hyperlink that text to the Facebook group or page of your choosing. Option #2: You can use our *|FACEBOOK:PROFILE:mailchimp|* Facebook merge tag. With this merge tag you will replace the “mailchimp” portion of the tag with your unique Facebook page/group name or ID number (The portion of the URL that comes after http://www.facebook.com/______). Please don’t hesitate to reach back out to us by replying to this email or hopping into a live chat if you have any more questions. Oy. Thanks for clarifying that the PROFILEURL merge tag is downright broke. Does TRAKTOR have bad quality sound? Do STEMS sound inferior? "The website of MMD France has been redesigned with the help of Canton Becker early 2010. Since then a declining sales trend has been reversed and our website enjoys a growing number of visitors and buyers. We have received spontaneous praise for our site, as being very clear, full of easy-to-find interesting information and with a beautiful design. The professional approach and advice of Canton - both in terms of marketing and sales, and of web design - has been instrumental to the success of our sales of software and training/coaching activities in our market. Thanks!"